I´ve had a discussion recently with my friends about how the ranking system works and noticed, that there are a lot of rumours and unconfirmed claims about CS:GO´s ranking system. So I´ve decided to take a closer look on the ranking system and find the true info about how it works. 1) What is a rank and what ranks do we have? Rank is a skill group, that evaluates you in CS:GO Classic Competetive mode. Every player receives a rank depending on his skill. The matchmaking system searches using your rank possible opponents in the same/near skill group. The ranks were introduced to avoid unequal matches and this way to improve the enjoyment of the game. 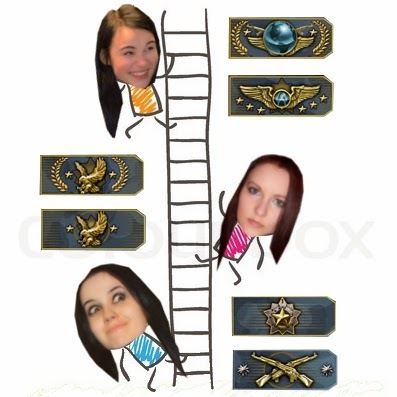 The players receive their rank after winning 10 matchmaking matches (max. 2 wins/day) and from that moment their rank is displayed in main menu under avatar picture, medals and displayable items. The rank changes in time with you being better/worse. 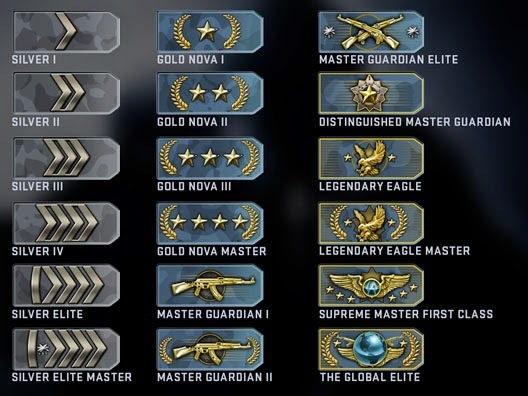 There are ranks from simple silver I to Global Elite. There are total of 18 levels in the game. 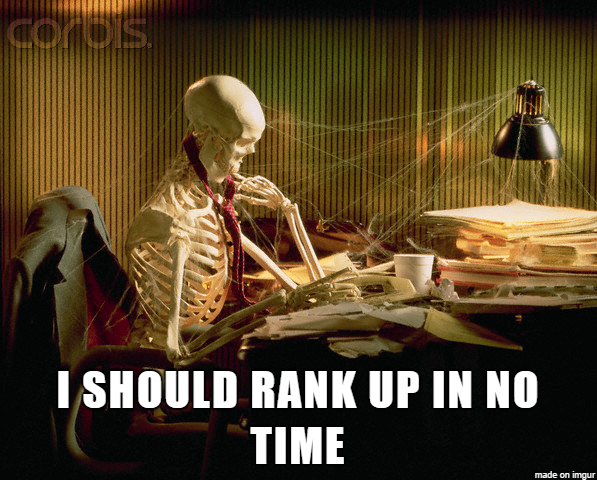 If you are ranked in one of the levels, this level covers a wide range of ranking (ELO) points. So 2 people ranked as MGE could be still far away from each other in ranking system. By playing, each player gets/loses different amount of points depending on his ranking points and the ranking points of his opponents. 2) What affects your rank? From your current rank is counted the chance of winning each round against your opponents. If you have higher rank than your opponents, your chance of winning is higher, so you lose more ranking points if you lose and you get only a little ranking points if you win. For example: A Supreme gets only a small amount of points by winning a round against Nova 4. When the Nova 4 wins against Supreme, he gets a huge amout of points. That does mean, that the Supreme is more likely to de-rank if he plays against Nova 4, than Nova 4 playing against Supreme. Winning is important, but there are cases of players, that ranked-up or de-ranked after a 15-15 draw (or even de-ranked after win or ranked-up after lose). That confirms the theory, that what really matters are the wins of individual rounds in the match. For every round in the game, you have a specific chance to W/L, that is counted once again for the next point. So try to win every round you can even if you´re losing! How much ranking points you get depends on your current rank and the rank of your opponents, from which is the chance of winning counted. It is impossible to gain ranking points on round loss and lose elo points on round win. Try to get as most MVP stars as you can get. That means, that if you want to rank-up fast, take the bomb and plant, defuse, try to be the best and most effective player of your team. The player who scores an MVP is rewarded a significantly larger share of points than the other four players in his team. A player with 20 wins is able to rank-up and/or de-rank A LOT faster than one with +100 wins. So the more matches you´ve won, the slower you´re ranking up and de-ranking. 3) How does matchmaking function? Your rank decides the skill groups, which you could possibly be matched against. The range of ranks of your opponents is very wide on the start and it gets smaller the more you´re playing (the more matches you win, the more accurate your rank is) So it could happen you will be ranked sometimes against too low/ too high ranks, but it´s because of you/your teammates/your opponents could be fresh players and the range of skill groups they could play against is very wide. 4) What effect has surrender, tie, leave/kick on Elo points? Since the ELO points are not based on win or loss, but on round results, both promotion and demotion are possible when a draw happens. One side will allways lose/win some ELO points at a round end. You can surrender only if one player leaves the match and your team is weakened. The player, who left the match will keep only the changes for his ELO points till he left. For the players, that stayed on the server, the ELO points for 5 players will be divided between 4 players, that stayed on the server. So you can get a lot more points if you play in 4. If you reach MVP by playing as BOT, your points will be disributed between all 4 players. That means, if on player leaves, remaining 4 players gain more points for round wins and the enemy team loses more points for round loses. So it´s not wise to surrender if you´re strong enough to win some rounds. The player, who left/was kicked the match will keep only the changes for his ELO points till he left (so if he left in the fourth round, only the four rounds he played counts into his ELO score). What happends in the match afterwards does not affect his ELO points. Kick does not affect his points either. Better option for you is to try to play matchmakings with 4 more skilled friends, learn and get better by playing with them and have a chance against evenly-skilled or slightly better opponents. 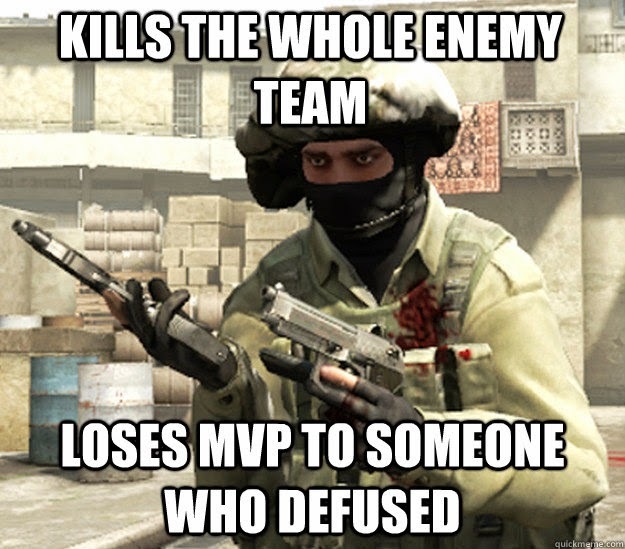 In this point, you have read the text above and you know every MVP counts for you to gain ELO points, so try to get kills, plant and defuse bombs. Every player with no matchmaking experience has to win 10 matches before getting his rank. He can either play alone or group with other 4 players (grouping with less players is not possible). An unranked player will start playing with a default amount of ELO points. When he wins, he will play against player with a lot higher skill group, If he wins, he will gain a bigger amount of points and play against higher skilled groups. In order to achieve a higher rank, you have to win the early matches, that place you early against much higher ranks. For example winning first 4 matches, then lose 4 matches and then 6 matches will give you a higher rank than losing the first 4 matches and the win all of the matches afterwards. If you want to play with your friends, i doubt you will be all at the same skill/rank in CS:GO. It could happen, you´ll lose some games with your lower ranked friends and you drop easily even 2-3 your ranks in very short time (´cause you were supposed to win with your rank). 1) Stay and play with your friends, play better than them, but have the same rank as them. You can enjoy your time with your friends without spending money/solving issues woth some second "smurf" account, but you have to face then the di*ks, who will laugh about your skill group. 2) Buy a second steam account and smurf games with your friends. You´ll be able to save your main account from de-ranking and still be able to play with your friends. But keep in mind, that smurfing is spoiling ranks and game enjoyment of your opponents, which is not a fair thing to do. 3) Stop playing with your friends and start to play with people in your or higher skill group. This option isn´t very friendly thing to do, but it could improve gaming experience for your friends and you. 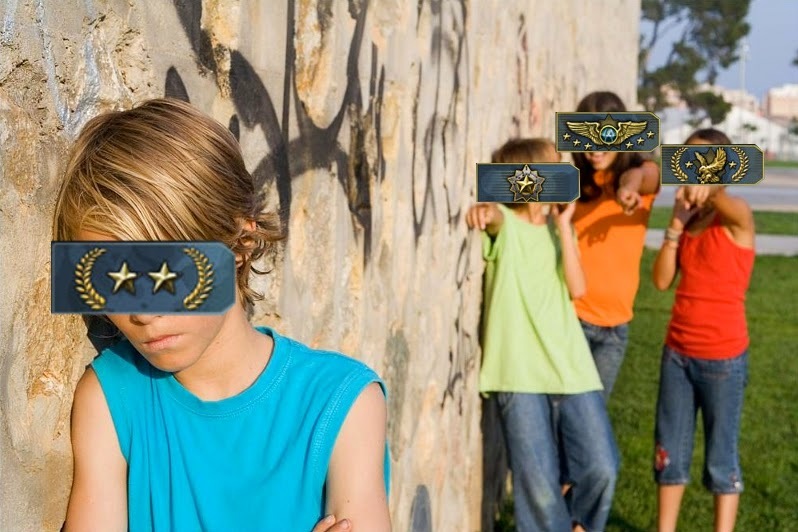 And please, guys, don´t be such di*ks about ranks and don´t laugh at lower skill groups than you. Each and every player started somewhere and it´s really stupid to ruin the game for others by you being foul-mouthed. You´re only showing how stupid you are. check also this out for more detail about ranking system. Great article keep up good work! Lolepicshop- The Best Shop to Sell Your LoL Account. Sell League of Legends account easily and also Buy Unranked Level 30 LoL Accounts. Do you want to get service for csgo, you can buy csgo and also can get good quality for the buy csgo accounts. Here are options for the csgo smurf accounts, csgo rank accounts and csgo prime accounts. We are aggregate gathering of CS:GO devotees, much the same as you, who would like to bring fun into CS:GO giving players the chance to experience all levels and expertise gatherings of the focused scene. From the most reduced silvers to The Global Elite, we cook for all levels of rivalry. Here are possibilities for the csgo Ranked Accounts, csgo accounts, csgo prime records, csgo smurf accounts, csgo rank boosting, buy csgo Ranked Accounts and purchase csgo accounts. Purchase CSGO Smurf Account. 100% Legit, Reliable and Fast Service CSGO Accounts For Sale. All purchase csgo account from $11.95. csgo prime record likewise accessible. Here are possibilities for the csgo prime account, csgo accounts, csgo prime records, csgo smurf accounts, csgo rank boosting, purchase csgo Ranked Accounts and purchase csgo accounts. We are collective group of CS:GO enthusiasts and csgo Ranked Accounts, just like you, who hope to bring fun into CS:GO giving players the opportunity to experience all levels and skill groups of the competitive scene. Buy csgo Ranked Accounts From the lowest silvers to The Global Elite. Get best deal to Buy csgo accounts. Buy csgo prime accounts with guaranteed and secure processing. Buy csgo smurf accounts at lowest price in world. Thanks for sharing this useful info.. I just got one good website who is giving free CSGO Skins , free H1Z1 Skins ,Free Unturne Skins ,Free Steam Card ,Free Armello Skins ,Free Rust Skins ,Free Dota 2 Skins ,Free PUBG Skins and many more cool stuff! visit this website to get exclusive free games, gift cards and offers: gamersbone.com :-) Thanks! This is a truly good site post. Not too many people would the way you just did. I am really impressed that there is so much information about this subject that have been uncovered and you’ve done your best, with so much class. If wanted to know more about green smoke reviews, than by all means come in and check our stuff. You can find there lot's of free stuff like free pubg skins and many more! Thanks for providing this useful information. Nowadays, players are purchasing CSGO accounts which is also a good way of getting higher rank easily. There are different CSGO accounts available like Pvt2 accounts, Silver accounts, Gold Nova accounts, Global Elite Accounts, etc. One of my friends purchase Gold Nova account and he got an opportunity to play for Gold Nova rank directly. Heya just wanted to give you a quick heads up and let you know a few of the images aren't loading properly. I'm not sure why but I think its a linking issue. I've tried it in two different web browsers and both show the same results. Hey, Thanks for sharing this article really appreciate.gold nova 1.